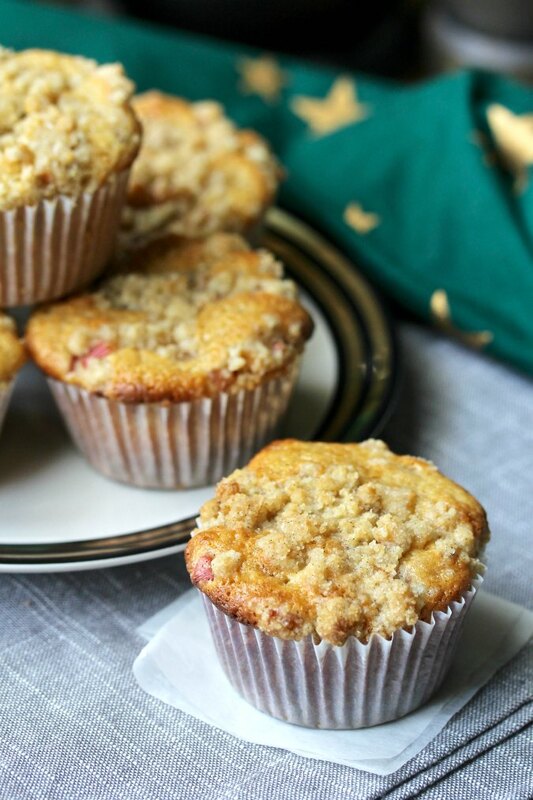 These Rhubarb-Ginger Muffins with Rhubarb Streusel are a wonderful way to use rhubarb, a beautifully colored sweet/tart vegetable. 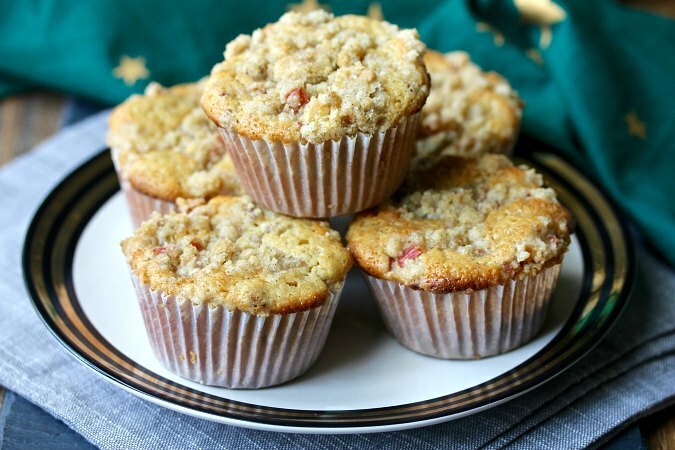 Buttermilk and sour cream add richness to these rhubarb muffins, and the ginger, nutmeg, and vanilla play so nicely with the rhubarb. The Rhubarb vanilla bean streusel adds a wonderful crust on top. Rhubarb has been making an appearance all summer long in my local grocery store, which is unusual. Rhubarb has never been particularly popular here, and when I've tried to find it in the past, I'd have to use frozen (which was also difficult to find), even in the summer. Suddenly, just this year, my neighborhood Ralph's grocery store has been carrying rhubarb! While the rhubarb section is super tiny, the rhubarb stalks are firm, shiny, and fresh. Of course I had to bake with it. By the way, I thought it was cute that, when I bought the rhubarb for the recipe, the checkout clerk wanted to know what I was going to make with this exotic ingredient. These muffins are best the day they are made, but they are still delicious the next day or two. You can even warm them in the microwave for a few seconds. They are so moist that they don't need any butter at all. All of my taste testers at home and at work loved them. This recipe is super easy, especially if you use a kitchen scale. My favorite one is the OXO Pull-Out Display scale, because I can use it to measure bread ingredients, even in very large containers. If you use a scale, you don't have to drag out and wash measuring cups, pack the brown sugar, or fluff your flour and cross your fingers that you are measuring it correctly. Just place the bowl on the scale and add the ingredients while watching the digital display. Sometimes muffins that contain cut fresh fruit or vegetables will get a little soggy from the moisture in the fruit if you store them in an airtight container, but if you store them without covering them, they will dry out. To store the muffins, line your airtight container with a layer of paper towels, place the muffins in a single layer on top of the paper towels, and place a layer of paper towels on top of the muffins, and close the lid to the container. This seems to help prevent the muffins from becoming soggy without drying them out. Thaw the frozen rhubarb and then drain in a colander before chopping. 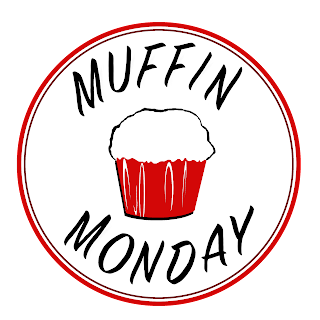 After the recipe, be sure to check out the rest of the delicious muffins from the Muffin Monday bakers. Thank you to Stacy of Food Lust People Love for creating this group! Next month will be our three year anniversary! I'm pretty sure I haven't missed a month! Line muffin tins with 18 muffin liners. I used two 12 cavity muffin tins and lined 9 in each tin. Whisk the flour, sugar, baking powder, ginger, nutmeg, baking soda, and salt together in a large bowl. Add the rhubarb and toss to coat. Whisk the eggs, sour cream, buttermilk, melted butter, and vanilla bean paste together in a medium bowl. Add the zest and stir. Add the egg mixture to the flour mixture and fold to just combine. Divide the batter among the muffin cups and top with the streusel. Whisk the flour, sugars, salt, and ginger together in a medium bowl. Stir the vanilla seeds into the melted butter and drizzle the mixture over the flour mixture. Stir with a wooden spoon to combine. Squeeze the mixture with your hands until you have a crumbly texture. Stir in the rhubarb. Recipe adapted from Bake From Scratch May/June 2017, an amazing magazine you must subscribe to. Your curious cashier made me chuckle, Karen. I've often been asked how to cook rhubarb when folks see it in my basket in the US. Your muffins are fabulous, as always. Thanks Stacy. That's funny that it's happened to you too. Why would one need to store these? Why wouldn't one simply eat all of them? COME ON, PEOPLE. Excellent question! They're not trying hard enough. 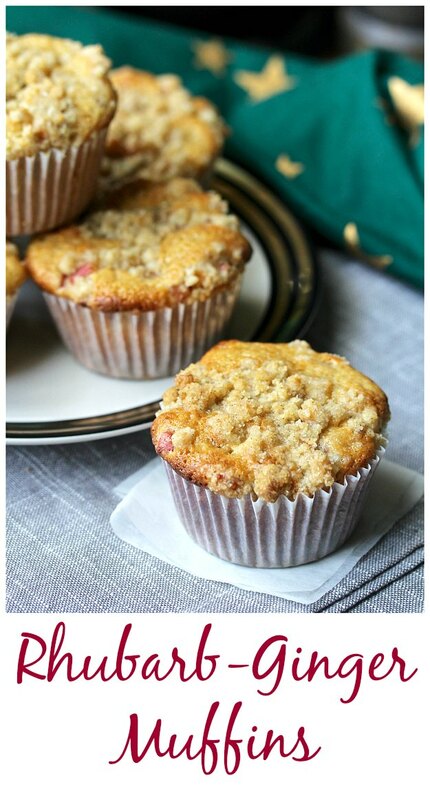 Always happy for more rhubarb recipes Karen and I'm sure the ginger was the perfect flavoring for these muffins. I think I've still got a little rhubarb hidden away in the freezer. These sound delicious! I have never cooked with rhubarb -- I must try it and this recipe very soon! It's pretty new to me too. They look like red celery stalks.